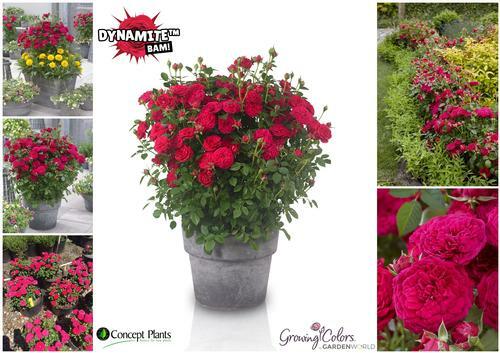 The variety name 'Bam' refers to how quick this rose will finish, profuse blooms occur quickly in the spring and won't stop until the first frost, 4" wide cherry-red flowers are fully doubled, vigorous and disease resistant foliage, can be used in containers or a low hedge. Roses are popular flowering shrubs that bloom prolifically in summer through fall. They are available in many flower colors and sizes and are known to have fragrant flowers. Generally, roses prefer full sun and well-drained soil that is nutrient rich with plenty of organic matter.